You are currently browsing the tag archive for the ‘Dimitri Karras’ tag. Dimitri Karras and Stephanie Marroulis had dinner at the Thai Room on Connecticut and Nebraska, then went back to Stephanie’s place and watched that cop show everyone liked on TV. Karras noticed that every time they ran out of ideas, the writers would send the main character into a bar so that he could fall off the wagon again for an episode or so. But he liked the show all right. It was something to pass the time. This book’s blurb carries a quote from Stephen King ‘Perhaps the greatest living American crime writer’. King’s a great man for book blurb quotes, but there is no hyperbole here. After all Pelecanos was one of the writers on The Wire, one of the greatest crime shows on television in recent years (leaving the types of shows described in the quote above in its dust). A show which, I am ashamed to admit, I have yet to make it through the first season. While I do love it, I found myself really caring about the well-realized characters and as I suffer from what Germans call fremdschämen, I am terrified to find out what happens to Kima Greggs after the botched sting. That’s the hallmark of quality in Pelecanos’ writing as well. He makes you care about the lives behind the crime statistics. In downtown Washington DC, July 1995, three criminals, brothers Frank and Richard Farrow, and karaoke-loving Roman Otis, target a Pizza joint called Mays. The job immediately goes wrong. The gang kill the customers and staff and then shoot a cop alerted by the gunshots. As they speed away in their car, Frank runs over a five-year old boy. Afterwards they dispose of the car and weapons, clean up and go their separate ways. Come January 1998 the case has been declared a cold case, as no evidence pointing to the gang was uncovered. Still Frank has unfinished business in Washington. The cop who confronted them outside Mays shot and killed Richard, though the police never found his brother’s body. Frank crippled the cop that night, but he reckons he’s due more pain. In the years since the massacre at Mays the family members and loved ones of the victims meet every week at a support group. Dimitri Karras is the father of the boy who was killed by the gang during their getaway. In the years since his marriage broke up, he gave up on his career and his only routine is waiting for the day of the support group to come round again. A family friend approaches private detective Nick Stefanos to help out the bereaved father. Turns out the Karras and Stefanos families go way back, both coming up in the immigrant neighbourhoods of Chinatown in Washington back in the ‘30s. Nick gets his childhood friend a job working in a bar back in the kitchen. Dimitri starts to find his rhythm again, enjoys making new friendships, having a routine that does not focus solely on his grief. Still he can’t forget what happened to his boy, can’t stop thinking that if the opportunity were ever to arise, he would find his son’s killers and let justice be done. Pelecanos excels in character work and dialogue, but what I really loved about this book was the unofficial soundtrack that runs through each page. The characters joke and poke fun at one another while listening to Motown records, seventies kitsch makes the staff of Karras’ workplace groan, and the go-go music scene native to Washington is touched on. The writer captures a real sense of time and place by discussing styles of music. There is a great scene with karaoke-fan Otis trying to do justice to an Al Green number in a country bar. This murderer and career criminal is left deflated by the experience. In Pelecanos’ fiction we get to know the criminals as well as the cops. Both skirt the moral dividing line and deal in greys instead of black and white. No lie, I read this book in one sitting. 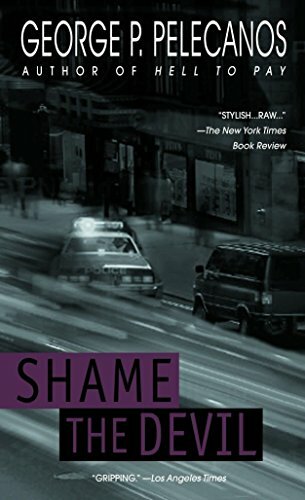 Not only is it a crime drama, this book deals with the morality of justice and the possible comforts offered by the idea of judgement after death. Pelecanos’ Washington is left high and dry by bureaucrats and out-of-state lobbyists and businessmen, with the native populations descended from immigrants left to fend for themselves. The law is not colour-blind. This is vital, thrilling fiction. Strongly recommended.